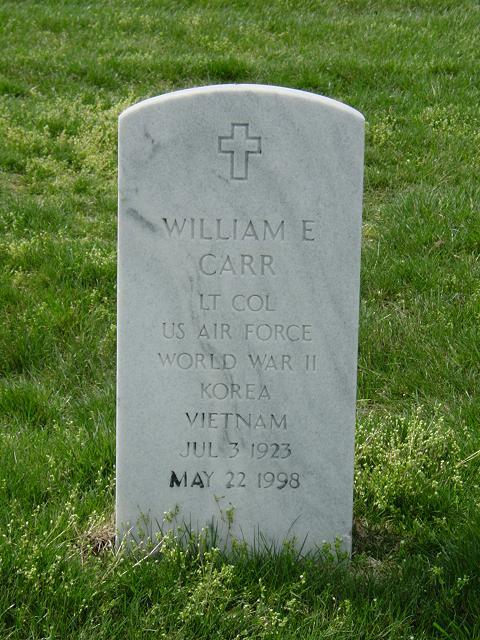 William E. "Bill" Carr, 74, an Air Force lieutenant colonel who later became director of training for the Federal National Mortgage Association, died of prostate cancer May 22, 1998 at Sibley Memorial Hospital in Washington. Colonel Carr, who lived in Chevy Chase, was born in New Haven, Connecticut. During World War II, he served in the Army in the Philippines. He later graduated from Howard University and reentered military service as an Air Force officer. He was a radar observer and then a master navigator, with more than 3,500 hours of flight time in fighters and bombers. While serving in the Air Force, Colonel Carr received a master's degree in business administration from Michigan State University. He later served as comptroller of the Air Force base in Cigli, Turkey. In 1968, he became chief of the status analysis division at Strategic Air Command headquarters in Omaha. In 1971, he retired from the Air Force and settled in Washington as a director and vice president for budget and personnel at International Group Plans. He later was training director at the Federal National Mortgage Association, from which he retired in 1982. Colonel Carr was a golfer and a member of Indian Spring Country Club and Washingtonian Golf and Country Club. He was president of Homebuyers Inc., a nonprofit organization that helps low-income families buy homes, and he participated in Man to Man, a group that works with inmates at the Lorton prison complex. His marriage to Helen Carr ended in divorce. Survivors include his companion, Sharon K. Congdon of Chevy Chase; and two sons from his marriage, Anthony Carr of Los Angeles and Michael Carr of Wheaton.